SB in Springfield. I like the original shield at the end of the road a whole lot better than the messy detour shields. 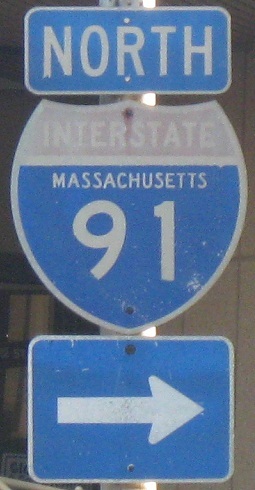 I-90 passes overhead on an original Turnpike bridge, also SB. Can't fit a paddle sign? 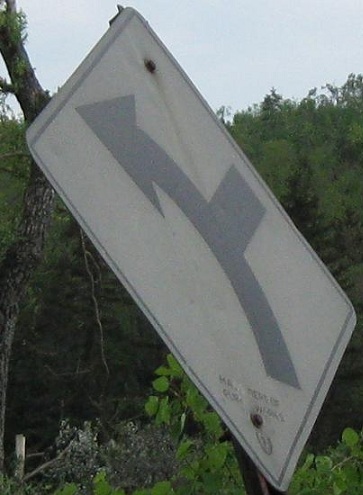 Trouble drilling a sign post in concrete? Just stick your sign in a bucket and I'm sure it'll be fine. 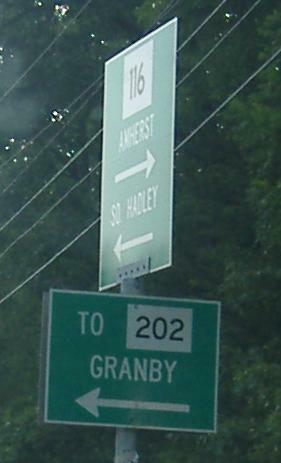 SB at Amherst St. in Granby, which leads to MA 202. MA 202? Nah, US 202. 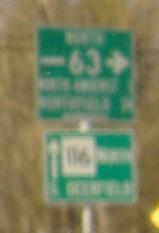 MA 63 is the only at-grade (signalized) intersection along the expressway part of MA 116, west of Amherst. 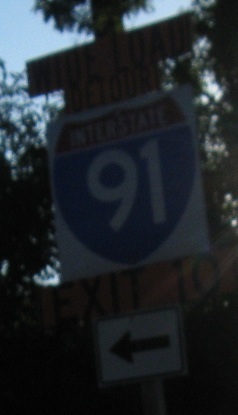 There is an interchange to the south serving U. 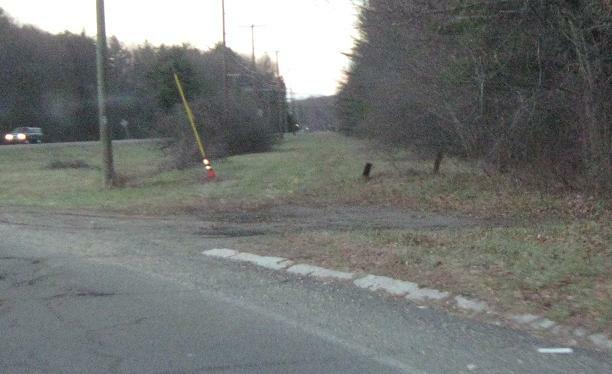 Mass., which is what caused the need for this road in the first place. 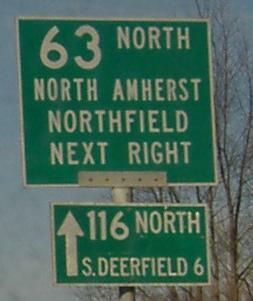 The old road, which heads straight after MA 116 NB turns left to multiplex with MA 9 WB, has a few-foot multiplex with MA 63 to 63's original beginning, then comes into MA 116 north of this intersection. These photos are northbound. 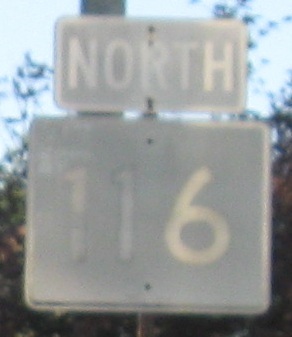 Old 116 meets current 116 north of Amherst. 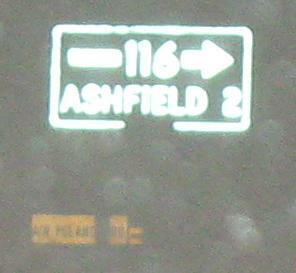 Freeway-sized shield for a freeway-sized road, but very much not freeway-sized font. 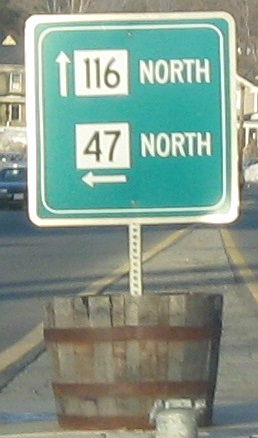 NB, an old sign for a confusing concept. 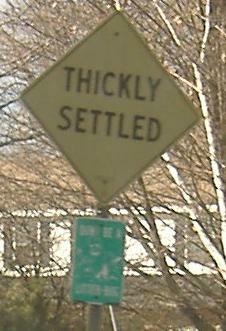 A lot of people outside Massachusetts don't see the need for a warning that there are houses ahead, or don't understand what constitutes "thickly." I imagine it's an excuse to give higher tickets for speeding (it comes with its own implied speed limit of 25). 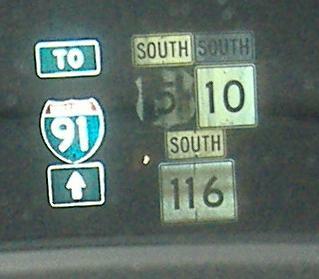 Three routes in all text, so you can't tell that that's really US 5. Another way to look at things in the other direction. 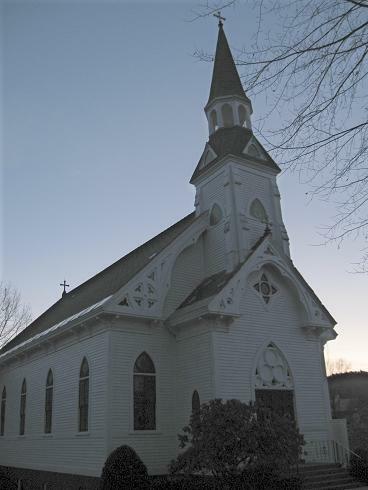 Old church on Delabarre Rd. in Conway. 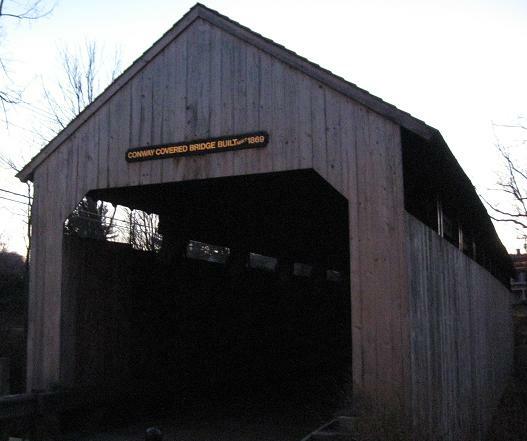 Although the bridge is in Conway, it is not the Conway Covered Bridge. 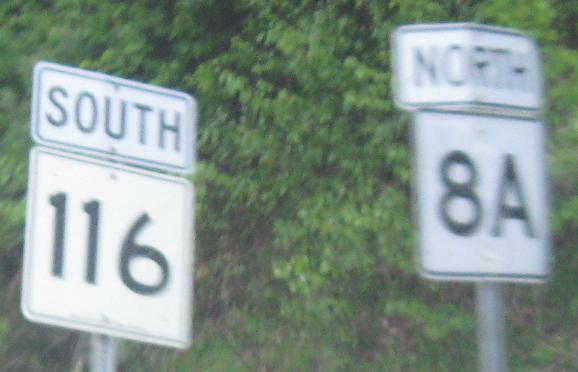 The plaque inside gets it right; the spread intersection of Delabarre Rd., Main Poland Rd. 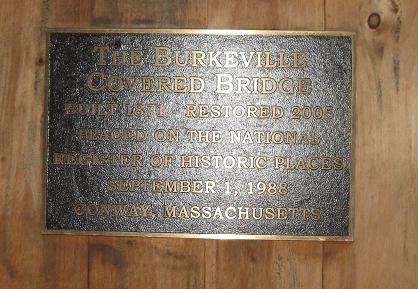 (which crosses/crossed the bridge), and MA 116 is Burkeville. 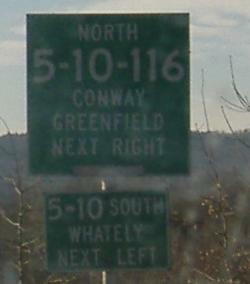 A different intersection to the east is Conway, even though they both fall under the umbrella of the same town. 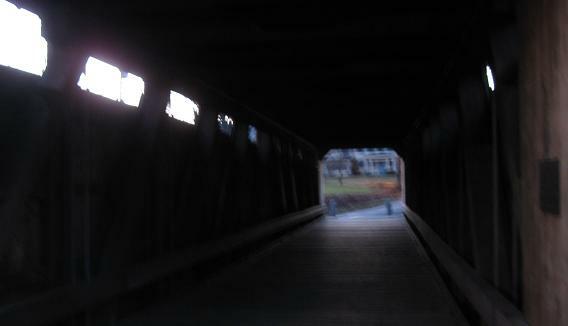 You see guiderail leading up to the bridge, but it is no longer open to vehicles, probably since the 2005 restoration. 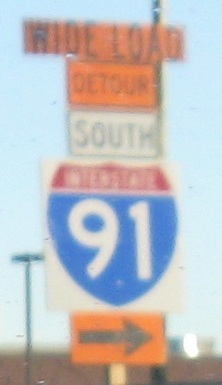 Westbound, with the west side of the bridge blocked by concrete posts and a chain. That, and the road no longer leads up to it. 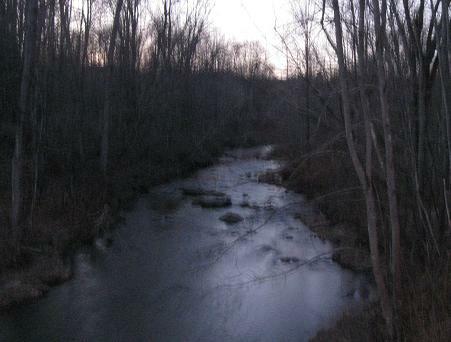 Eastbound, and you can see the millstone blocking the far side of the bridge. 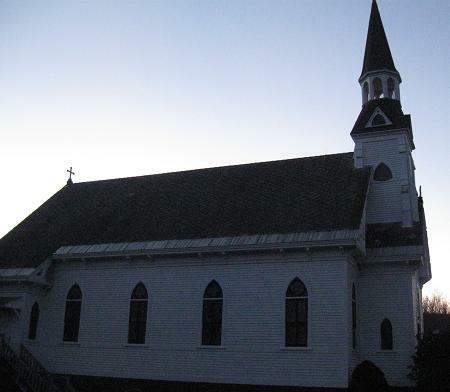 You can also see the back of the old church. Looking east and west on the South River past sunset. NB at a 5-way intersection in South Ashfield. MA 116 joins a wrong-way concurrency with MA 8A and steals its shield size. 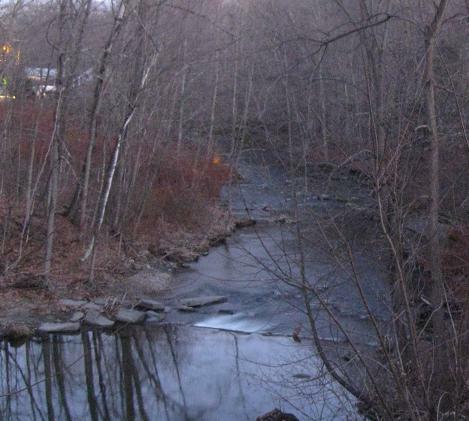 Two things you can see along the way on MA 116 SB/MA 8A NB, especially at dawn when the sun rises over Plainfield Pond. 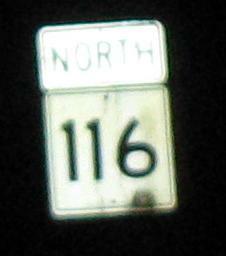 Another thing you can see is this old alignment of MA 116, which I took northward from the 8A concurrency. 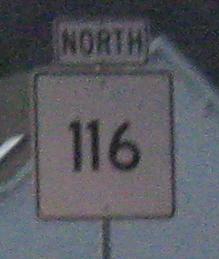 If this was ever MA 116, then it was also MA 8A, or even New England Route 8A from before individual states had numbering systems. Larger images of original Mass. DPW bridge railings and cable guiderail. 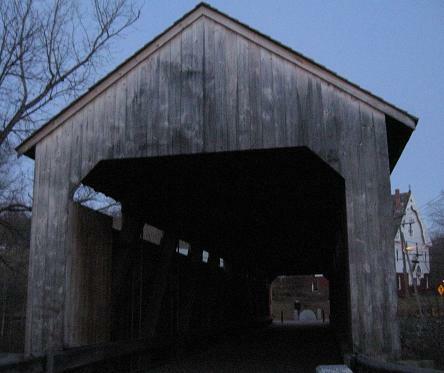 This bridge was probably constructed in the 1910's when the New England Route system was conceived. The old road continues around a bend and comes to MA 8A. 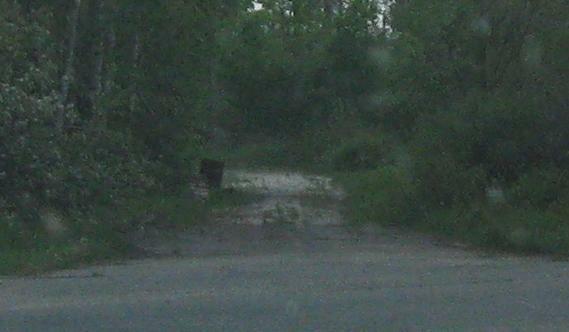 In the last photo, you can see double yellow lines as it crosses over 8A and peters out in the trees. 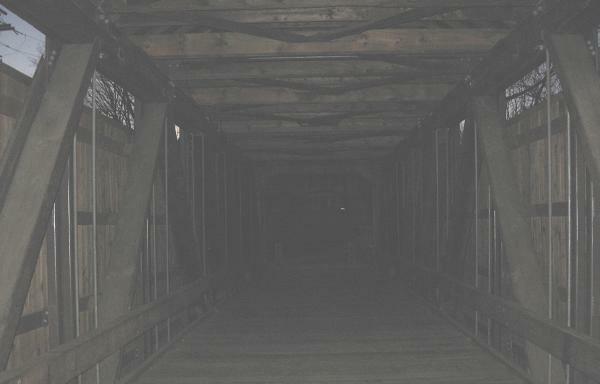 This alignment was probably active until the 1970's, although it may have no longer been the main route by that time. 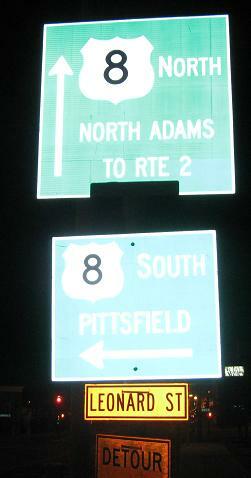 To the end of the road in Adams at MA 8, not US 8.